It’s National Library Week! This year’s theme is Libraries Transform, so we’re sharing a short history of how the Cal Poly library has transformed over the last 100 years. Cal Poly’s first library was opened in 1903 on the first floor of the original administration building. Since the library was adjacent to Director Leroy Anderson’s office, the duties of the librarian were assigned to Naomi Lake, the Director’s secretary. The Administration Building, on the left, housed the first Cal Poly library. The library would later move into Anderson Hall, the building on the right. University Archives Postcard Collection, ua-ast_00000073. By 1916 the library moved to the second floor of the Science Building, later known as Anderson Hall. Grace Hill was Cal Poly’s first full-time librarian, listed in the course catalog for 1916 (she was also the first advisor of the Polygram, Cal Poly’s first newspaper). 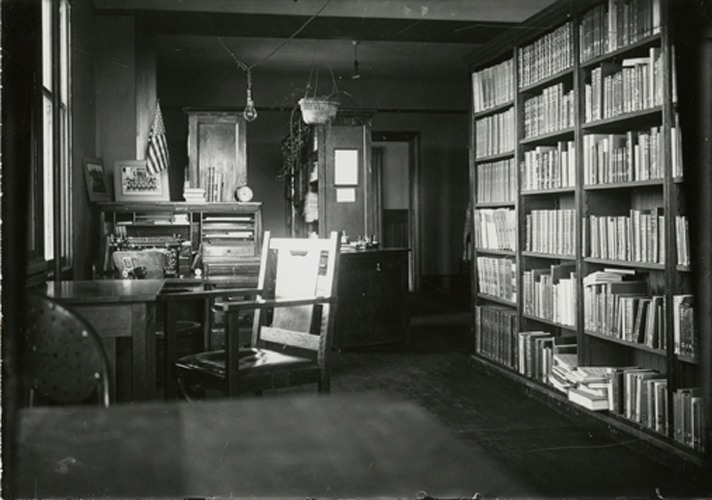 First known photograph of the Cal Poly library, after relocated to the Science Building, circa 1918. University Archives Photo Collection, ua-pho_00000553. In 1939 the library was relocated to the center of campus, in the newly constructed one-story classroom units. Captain J.C. Deuel, an instructor in Physical Education, served as Cal Poly’s librarian from 1925 to 1941. In 1942, the library moved to the recently completed Business Administration building (now known as the Cotchett Education Building). Future president Robert E. Kennedy, hired as a Journalism professor and publicity manager, was also appointed librarian. He would continue to serve as librarian until 1946, when Ainsley Whitman was hired as a full-time librarian. Dedicated in October 1948, the $700,000 Walter F. Dexter Library memorialized the Sacramento administration who had helped secure collegiate status for Cal Poly eight years before. It was the first space specifically designed as the Cal Poly library. Designed to furnish a well-appointed paradise for bookworms, the new, two-level structure will contain general and reserve reading areas, with storage space designed for 180,000 books…for the less aggressive hunter of knowledge a browsing room with soft chairs and a fireplace is contemplated. Front page news of the Dexter Library move-in. Click on the image to read the full issue. Dexter Library’s periodical reading room, circa 1950. University Archives Photo Collection, ua-pho_00000548. The Dexter Library Annex, added to the existing structure in 1962, more than doubled the size of the library. The addition offered 1,650 “reader stations” and book storage space for 150,000 volumes on four floors of stacks. A crowded view of Dexter Library in 1977. University Archives Photo Collection, ua-pho_00000544. However, by the 1970s the student population and needs were rapidly outgrowing the library. Student requests and petitions motivated President Robert Kennedy to lobby for the funds to build a new, larger, and more modern library on the campus. In 1977 construction on a new library began, completed in August 1980 at a cost of $11 million. 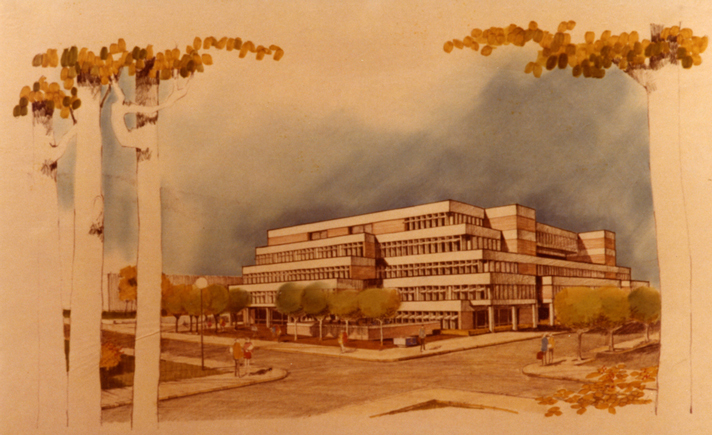 The proposed new library, designed by Marquis and Associates. University Archives Photo Collection. The library, designed by Marquis Associates, San Francisco, was three times larger than Dexter, and provided seating capacity for 2,500, compared to Dexter’s seating capacity of 574. The new library provided space for 625,000 volumes, three “rooms for typing,” five photoduplication rooms, and a full staff to manage the expanded collections. A new innovation, the “Automated Retrieval Service,” allowed students to request computer searches, completed by trained librarians, for a a fee of $10.00 and an approximate wait time of three to four days. Invormational brochure for the new library, circa 1981. You can read the brochure (and see the original layout of the library!) here. From its origins in one room of the first administration building to the present facility housing a collection of nearly five million items, the library contains rich collections of books, journals, electronic resources, multimedia, K-12 learning resources, and government documents. Researchers from every state and seven countries have traveled to the Kennedy Library to use our archival collections of manuscripts, rare books, architectural drawings, and photographs. Special Collections materials have been featured on the BBC, CNN, PBS, A&E, and in international print media. As the largest library between Santa Cruz and Santa Barbara, the library also plays a critical role in the surrounding community. Photographs provided by University Archives. Read more on Architecture Archives, cal poly history, special collections and university archives, and university archives.